Coleridge’s magical poem, interpreted for orchestra by RICHARD HILL, is narrated by Sir Ben Kingsley on this acclaimed recording, conducted by the composer. 'Images from Kubla Khan' [57 minutes] is designed to be performed as a concert piece for symphony orchestra with narrator. Richard Hill's ravishing and visually inspiring symphonic poem, with its stunning aural images of landscapes, rivers, war and paradise, also gives orchestras an opportunity to bring a star name actor to the concert platform as narrator of Coleridge's poem. The work, by virtue of its dreamlike imagery and story line, is also conceived as a one hour ballet in four episodes [see synopsis] for stage or television. Originally released in May, 1998, the recording of 'Images from Kubla Khan' was made by the Grosse Rundfunkorchester Berlin, at Funkhaus Studios, Berlin. The studio sessions were conducted by the composer. Ben Kingsley's narration of Coleridge's 'vision in a dream' was recorded at Saunders+Gordon Studios, London, and the album was mastered at Digital Barn, Fullbrook, California, USA. Released on the Nashville label OneMusic/Honest Entertainment, this cosmopolitan co-production achieved considerable national airplay in America and attracted warm and generous reviews from critics all over the country. Copyright in the original mandala series of designs for 'Images from Kubla Khan' is held by Gabrielle Uncles. The designs were commissioned for the cd sleeve of the American release of the work, narrated by Oscar winning actor Sir Ben Kingsley. They also form the basis of set designs for the ballet concept of 'Images from Kubla Khan'. The magical world of Samuel Taylor Coleridge's dream fantasy is perfectly reflected in these beautiful and mystical paintings, with their ancient and pagan symbolism. Orchestral line-up: 1 piccolo 2 flutes 2 oboes 1 cor anglais 2 clarinets 2 bassoons 1 contra bassoon 4 horns 3 trumpets 3 trombones 1 tuba 4 percussion 1 harp 1 narrator 16 first violins 14 second violins 12 viole 10 celli 8 bassi. Total performance time 56.47. The composer is grateful for the research and writings of John Livingston Lowes (1867-1945), Professor of English at Harvard University between 1918 and 1939, whose book The Road to Xanadu served as an inspiration and invaluable resource during the creation of this work. 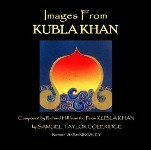 GRAND RIGHTS in the dance concept of 'Images from Kubla Khan' are held by Richard Hill. Copyright ©2018 Richard Hill. Site design by Paul Hill.